The elk antler stabbed the side of my shin. The rest of the elk antler dug into the front of my shin. I got up and the elk antler was still hanging from my leg. I ripped it out, threw it in the kitchen, and stretched out on the bed crying. It hurt that bad. The stab wound was close to 1/2 inch deep. At that moment, Lisa got home from delivering a jumbo birthday cupcake. She cleaned out the wound and bandaged me up...trying her best not to giggle. She finally got to witness my dog Mom graceful glory in the moment. 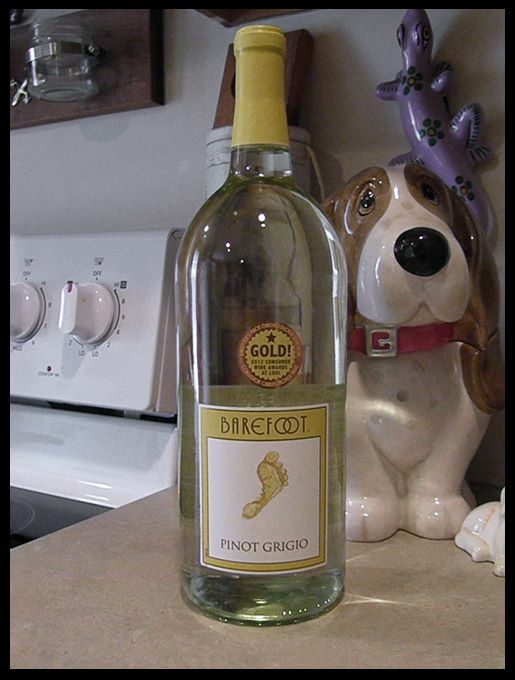 Once I was bandaged up and the tears dried, I reached for the last of my Barefoot Pinot Grigio. This gorgeous bottle of wine was left on my porch from our beautiful friend, Patti. An hour later, and once the pain settled in, I was well on my second glass of wine. Feeling a bit better. And, keeping my fingers crossed that the stab wound wouldn't get infected. I'll keep you posted, but if by some chance I forget, remind me!